Given enough physical space and operating temperatures below +125 deg C, the sensor electronics and the sensing module can be placed in the same housing. In all other cases, it is possible to place the sensor electronics elsewhere, connected via an up to 2 meter long, shielded or twisted-pair cable to the sensing module. When using the analogue signal output only, three connection wires are needed to work with the active sensor System: Ground (0 Volt), single positive supply (+6.5 V to +16 Volt), and the analogue output signal (+0.2 V to +4.8 Volt). “Zero” torque, or “Zero” axial load will be then +2.5 Volt. When using the serial digital signal interface, it depends on the serial digital bus format as to how many wires are needed. In most cases, the total number of wires will not exceed four. Which Mechanical Forces will be Measured? The final design of the inner part of the sensing module and the design of the sensor electronics determines which mechanical forces will be measured and which forces will be suppressed (or cancelled). The basic design of the active mechanical force sensing module appears to be almost identical, while the main sensor design difference (between torque-, bending-, shear-, and axial load-forces sensing) is how the internally placed magnetic field sensing device / devices are placed. When sufficient space is available inside the sensing module, then more than one mechanical force can be detected and measured. However, this will be done in custom designed sensing modules only. So, if desired and requested, it is possible to measure, with one and the same sensing module device, torque- and axial-load forces simultaneously and provide the measurement results separately at the signal outputs of the sensor electronics. Important: In some mechanical design cases, it may NOT be possible to differentiate between bending forces and torque forces when using only ONE sensing module. This issue can be perfectly resolved by using TWO sensing modules and placing them opposite to each other at the test-object. The actual cross-section of the front part (“face”) of the physical sensing part of the sensing module can range from 3 mm x 10 mm to more than 6 mm x 30 mm. It is the front-face of the sensor module that must be placed closest to the test-object. Currently the minimum length in radial direction (facing away from the test object) is 12 mm. The larger the physical dimensions of the sensing module, the more robust it can be built. In addition, a larger sensing module copes better with mechanical surface variances of the test-object (the term “surface variances” includes: magnetic variations, mechanical profile structural changes, rotational centricity wobbles, etc.). In most other cases the smaller the better. The elongated shaft of the sensing module housing offers itself as the natural place for the sensor electronics. The test object (from where the measurements will be taken) will be an already existing shaft (like the car’s transmission shaft), tooled from any ferro-magnetic material. Any ferro-magnetic material can be used as long as it has magnetic properties (meaning that a permanent magnet will be attracted firmly to the test object). Best measurement results can be achieved when the sensing region has been hardened (surface hardened or case hardened), but this is not mandatory. To take reliable torque measurements, the sensing module does not need to touch the test object. In fact, it is acceptable that there is an air-gap of up to 2 mm between the surfaces of the test object and the sensing module. Built into the sensors electronics is a distance compensation circuit that allows reliable measurements, even when the air-gap changes between the sensor and the surface of the test object. If the air-gap is larger than 2 mm, then the physical dimensions of the sensor head must be increased. This is only applicable for larger shaft diameters (e.g. turbine shafts). The Active mechanical force sensor module must be placed nearest to where the measurement is taken from. The front face of the sensing module should be placed as flat as possible (parallel) in relation to the surface of the test-object. The rectangular shaped front-face can be placed along the axial direction of the test-object (also called: “in-line” or “axial” direction), or can be placed perpendicular to it (in the “tangential” direction). The final sensor face orientation depends on the application and the available spacing. Drawings above: The Active sensing module can be placed “in-line” to the test object (as the transmission shaft, left picture), or tangentially in relation to the shaft’s cross section (right picture). For “standard” performance torque measurements, it is sufficient to place a single torque sensing module at the side of the test object (see picture below). For advanced torque measurements (higher signal bandwidth and higher signal resolutions), two torque sensing modules can be placed at opposing locations, nearest to the test object. Picture above: Example of placing one (left) or two sensing modules (right) nearest to the surface of a rotating shaft (test-object). The Active sensing module will pick-up and measure the selected forces. 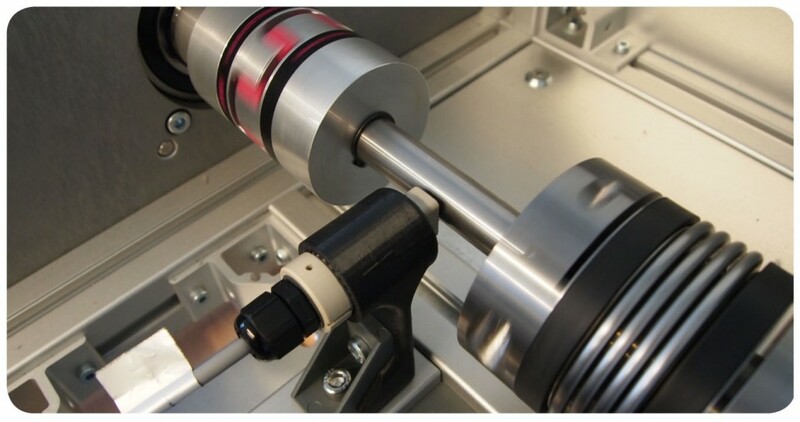 The active torque / axial load / bending sensor can be placed onto test objects (like the transmission shaft) that may already be magnetised and have not been degaussed. To differentiate between magnetic stray fields of different sorts, the actively generated sensing field has its own operational frequency. Therefore the active sensing technology is insensitive to magnetic fields that may be already stored in the test object, or that may come from elsewhere (Earth Magnetic Field, Solenoid and e-motor stray fields, etc.) Please note that maximum limits do apply. This makes this particular sensing technology VERY easy to use as it will start measuring the mechanical forces without having to consider what the magnetic history of the test object may be. The beauty of the magnetically Active sensing technology is that the magnetic field needed (“sensing field”) to penetrate the surface of the test-object is “actively” generated by the sensor electronics and the sensing module. By design, this field cannot age, nor can it be accidentally erased by interfering magnetic field sources. When the test-object is exposed to strong mechanical shocks, impacts, or vibrations, the sensor performance remains unaffected. Inside the Active sensing module, there are only passive electrical components such as inductors. These inductors (coils) are robustly built and can withstand high operating temperatures. The temperature limit for the sensing module is defined by the temperature at which the wire-insulation (of the inductors) will disintegrate. For many wire types this may be above +160 deg C, while for special (and more expensive) wires this temperature may be around +250 deg C.
It is important to note that the material of the test-object (gear-box shaft, for example) will become less stiff at higher temperatures. To a higher degree, this effect can be compensated for by the sensor electronics. As long as the chosen and additional coating of the test-object (shaft) is not interfering with the physical ability of dealing with mechanical forces, and as long as the chosen coating does not “block” magnetic signals, the Active sensing technology will continue to function properly. Chrome is a highly conductive material and will change the gain setting of the measured signals. The Active sensing module will still work properly but requires a one-time calibration to adjust to the signal-gain changes when chrome is applied to the test-object. In most cases a paint coat will not interfere with the sensors measurement capability and sensing performance. The internal clock of the Active torque sensor supports more than 3,500 measurements per second which allows following measurement signal-changes equivalent to 1,000 full cycles (or 1,000 Hz) per second. The internal signal filter of the sensor electronics can be programmed to any lower number of signal filtering to suppress mechanically caused noises, or any other unwanted signal interference. For further information and technical details, please contact the engineering team from Torque And More (TAM) directly.